Known to many as Cantor B- Rabbi Bruce Benson received S’micha from the Rabbinical Seminary in New York and is now ordained not only as a Rabbi, but also as a Cantor having been Ordained by Hebrew Union College in 1978. His background is quite wide ranging and includes pinnacle moments such as: having served as 2nd VP of NFTY, receiving a GRAMMY Nomination for a liturgical service written and recorded with KENNYG, having been published in a number of periodicals on issues relating to contemporary Jewish Life, has founded several Jewish Institutions, as well as many other benchmarks. His song, “The Healing Prayer” from his work the Rock Service, was recorded with Clarence Clemons of Bruce Springsteen’s band and can be found on You tube having been heard over 260,000 times. 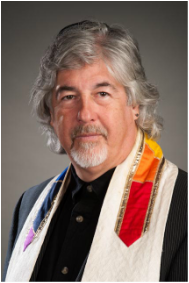 Having founded and served a number of Congregations as Cantor and/or Spiritual Leader, he has taken the next logical step and completed his studies to reach this plateau and has recently been elected to serve as the Rabbi of Temple Beth El-Israel of Port Saint Lucie.